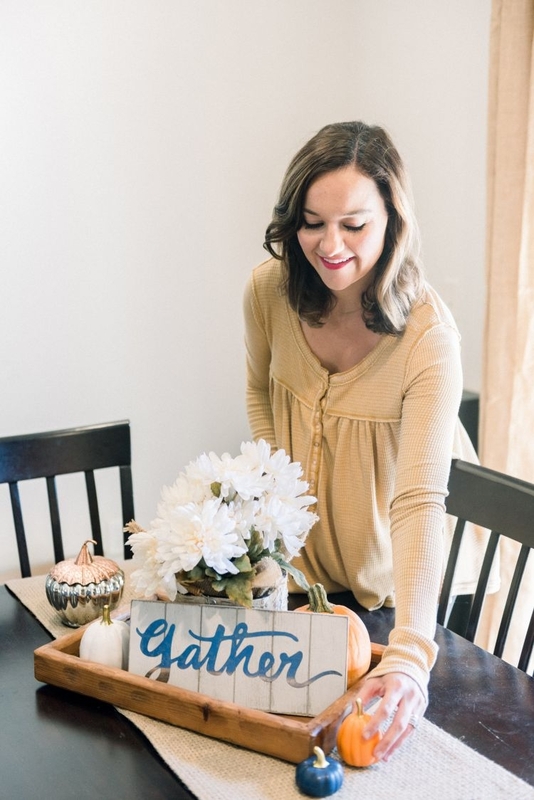 Thank you to Allstate for partnering with me on this fall home decor post! All opinions expressed are my own. Fall gives me all the happy feels! 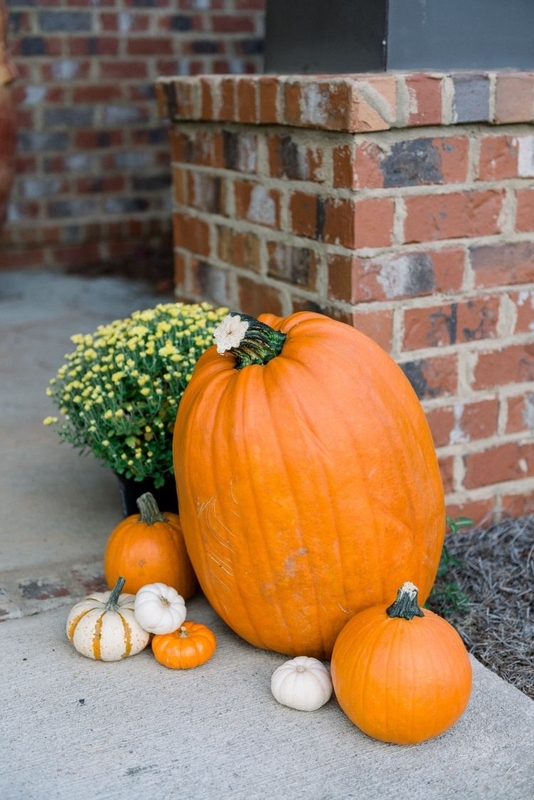 The cooler weather (aka anything other than triple digit Alabama heat), pumpkins, sweaters – and not to mention all the colors, smells, and flavors. 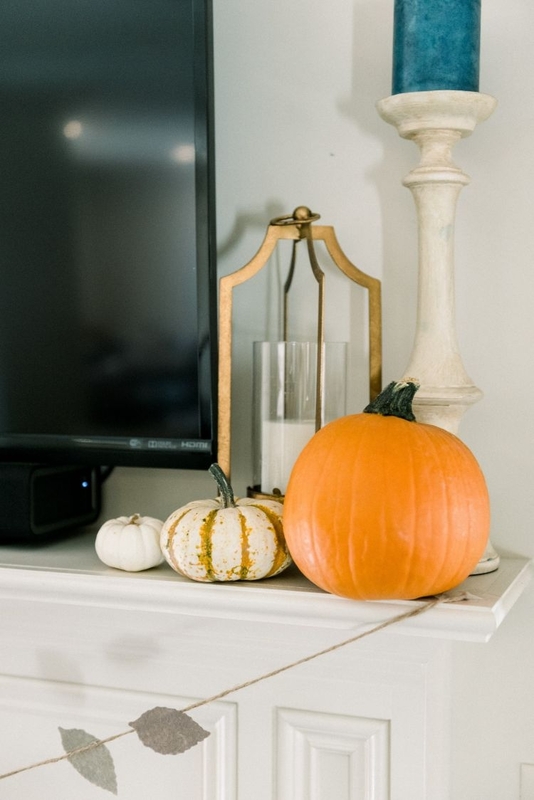 I love to celebrate the season by incorporating simple and affordable fall decor into our home. Y’all know I am all about keeping things EASY, especially this year with a newborn. For the most part, our home decor is compiled of very affordable pieces and we try and keep things very minimalistic and cozy! I am not big on crafting and DIY but I do love our DIY Travel Wall and the special memories it represents! Whenever I am needing design inspiration or creativity, I usually take to Pinterest for ideas! However, did you know Allstate has helpful resources too?! You may remember that I partnered with Allstate for Leyton’s first Halloween to share tips for staying safe during this holiday + a DELISH Paleo Chocolate Chip Muffin recipe, so make sure to check those tips and the recipe out too! 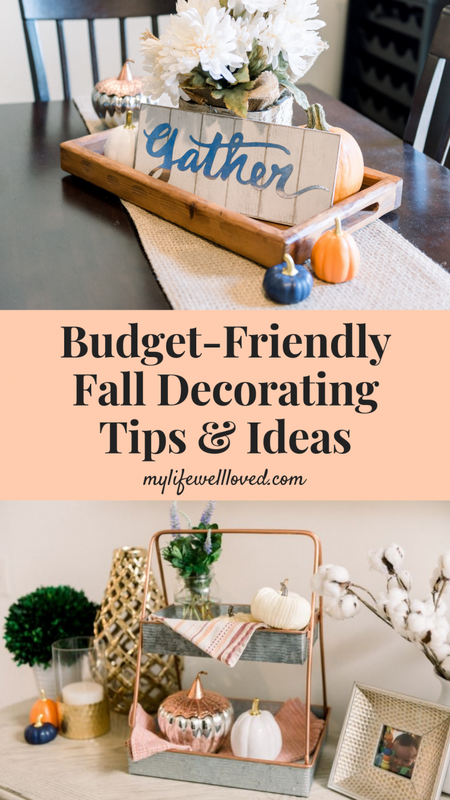 This fall, I am loving their 5 simple DIY decorating ideas that focus on doable and affordable fall home decor tips that are also safe and family-friendly! After checking out Pinterest and Allstate, I still wanted to hear YOUR tips and of course, you shared some of the best and cutest ideas! 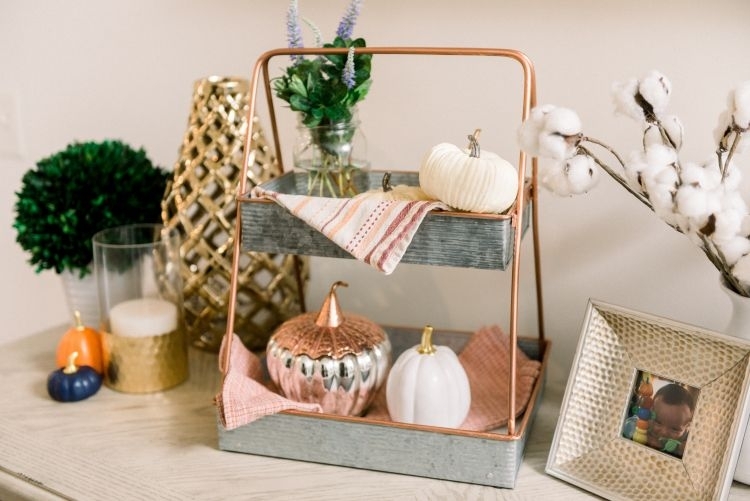 The two most popular answers were shopping Target Dollar Spot and Trader Joe’s Pumpkins – and that is exactly what I did! I found the cutest leaf garland in the Dollar Spot! 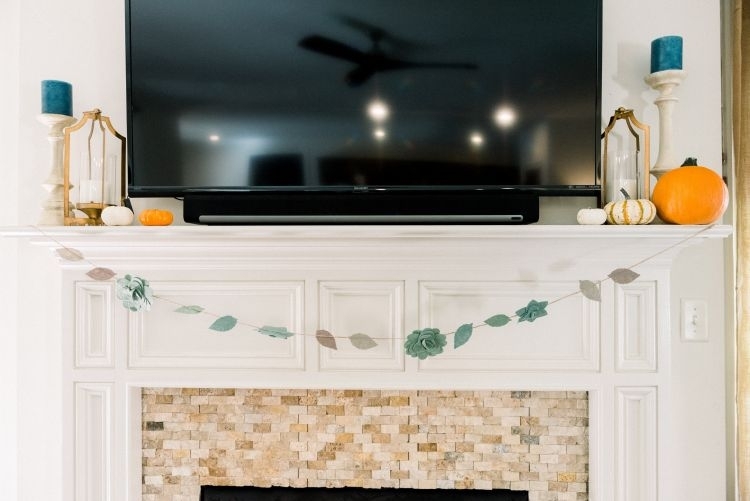 I love this because it is festive yet still coordinates with our other decor and was insanely cheap! One of the tips Allstate gives is to spook-ify the decor you already have. They give the idea of adding spiderwebs, ghost faces to your vases, and even masks on the faces in your paintings and portraits! So fun! I also grabbed several bags of little pumpkins, as many of you suggested, to use on our mantle, throughout the house, and on our porch! One of you shared the best tip with me – did you know if you wipe down your pumpkins with Clorox Wipes, they won’t rot as quick?! How cool is that?! Another one of you suggested not carving our pumpkins so we can keep them out through Thanksgiving, which is a great tip! Allstate also recommends decorating pumpkins with paint, stickers, and other decorative materials instead of carving to stay safe. 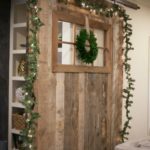 If you are looking for ways to dress up your front door, be sure to check out the DIY Eyeball and Snake Wreaths linked in this article! Of course, I had to add in some blue with my orange to support my Auburn Tigers! Even if you aren’t an Auburn fan (though you should be ;)), I love the blue hints mixed in with all the orange! I am seeing a lot of blue this year when shopping for fall home decor. If you are wanting to incorporate blue, be sure to look at these blue accent items that are very affordable! For our dining table, I decided to keep things simple! This is a high-traffic area so it makes sense to have a simple runner and most of our decor contained to this wood tray. One of you recommended a “gather” sign. I can’t find this exact one but here are several similar options from Amazon! I love this because it will work all the way through Thanksgiving! 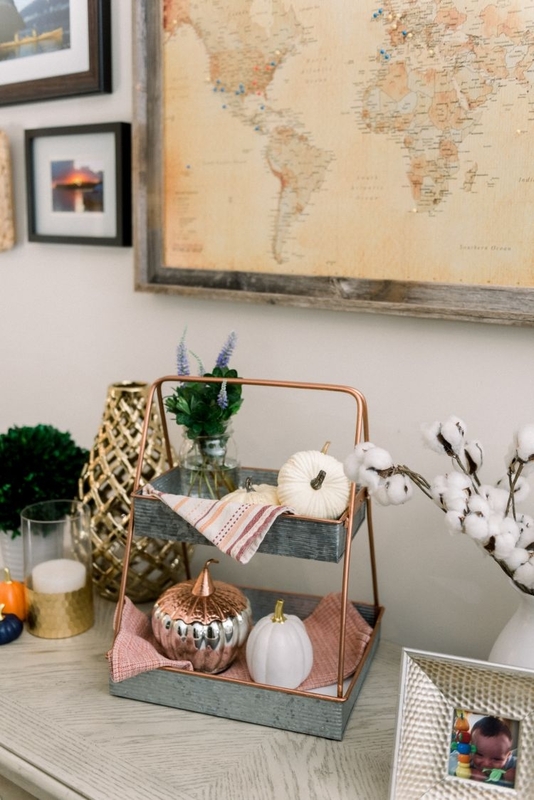 The last little space I decorated for fall is this table in our hallway! Again, I love using decor that coordinates with the colors and themes we already have in our home so it feels very natural and maintains our “homey” feel! In this space, we have our DIY Travel Wall hung above and I love how the fall home decor compliments all the earthy tones paired with the brass and galvanized metals. 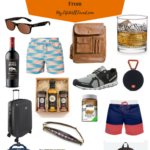 You can shop similar items I found linked above. 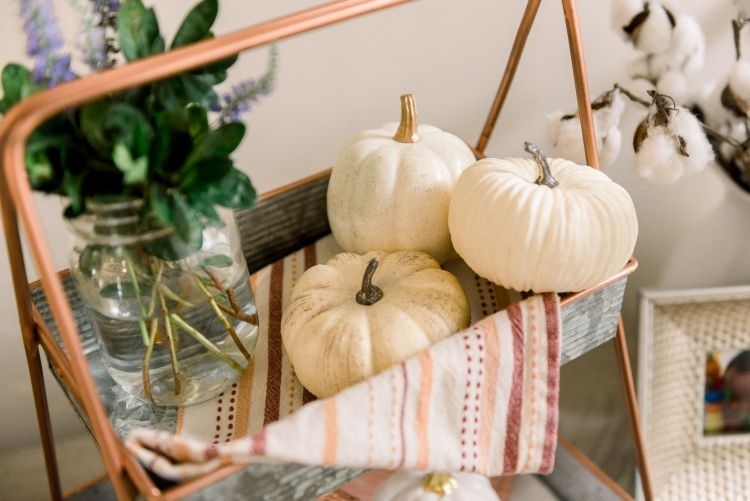 Many of you shared amazing fall home decor ideas that I HAD to share! I have linked as many options as I could at retailers with 2-Day Shipping or that are easily accessible for you to grab ASAP! I love when you share tips for incorporating your toddlers into the fall fun! I love these little Halloween painting kits and sticker books for kids from Target! 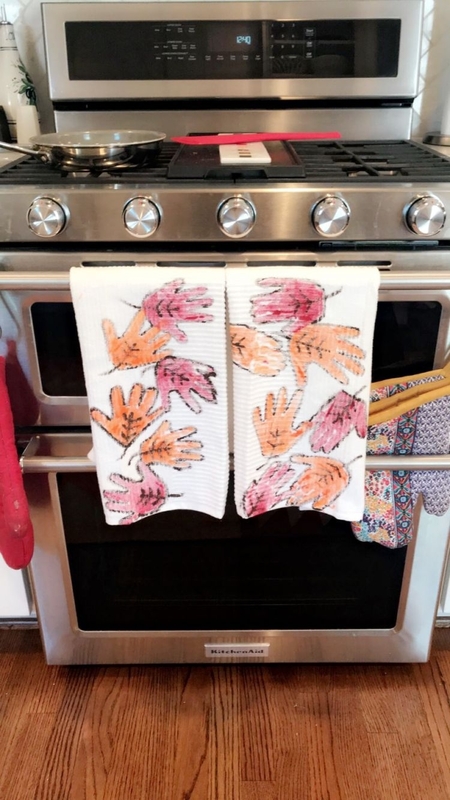 However, my favorite idea one of you mentioned is handprint leaves painted on kitchen towels. You can find the kitchen towels here at Target and fabric paint at Michaels sold by the bottle so you can choose which colored leaves you’d like to paint! 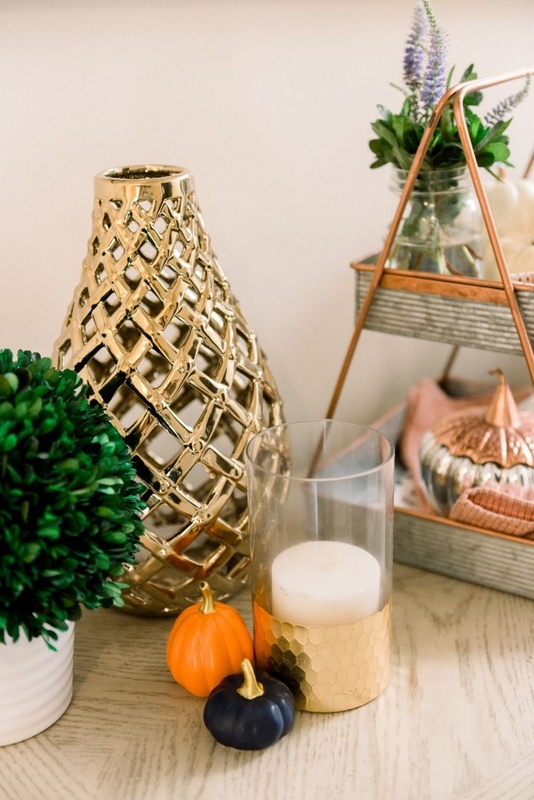 I hope you are inspired by all of these fall home decor ideas! As you prepare for Halloween, be sure to check out Allstate’s 3 tips for staying spooky yet safe and 4 non-candy treat ideas to pass out to all your trick-or-treaters! 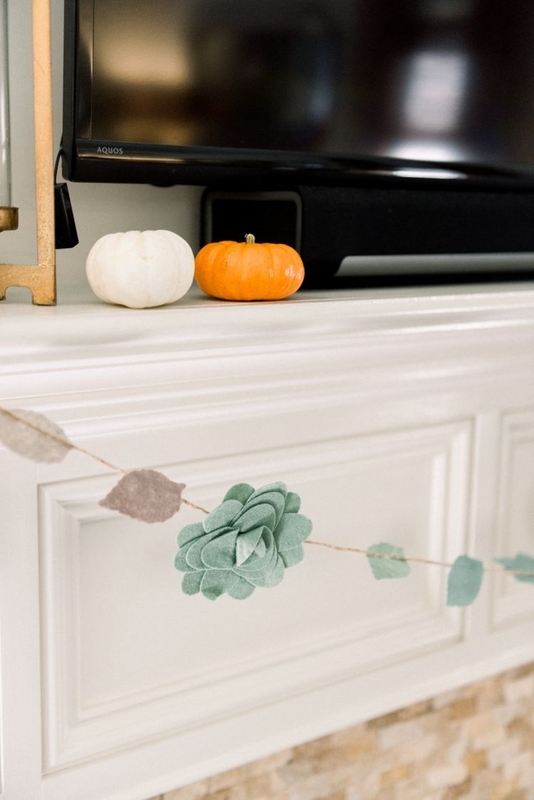 Pin the Budget Friendly Fall Decor Ideas Later! Previous Post Best Salad Recipes Shared by You!